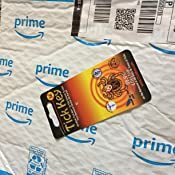 Amazon's Choice for "tick key"
Sold by Marathon Commerce, LLC. and ships from Amazon Fulfillment. 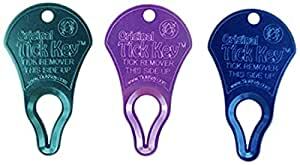 These tick removal keys work great. 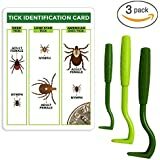 My husband and I each keep one on our car keys and then we keep the third in the bathroom because unfortunately in the shower is where I find most of the ticks. 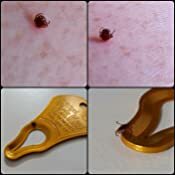 If the tick has already bitten you, you just place the circle key hole around it's body pressing it tightly up against your skin and then you slide it until it's head is caught securely in the pointy part of the key hole. At that point you lift the key away from the skin and it should pull the tick right out. If this doesn't work try sliding the key in the other direction. This little tool always helps me get the tick heads out; whereas I've had many tick heads break off and stay stuck in the skin when we've tried removing them with tweezers in the past. Once the tick is out though it's still alive so make sure to burn it or flush it down the toilet or otherwise safely dispatch of it. 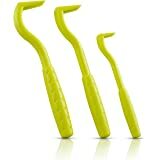 I have also gifted these tools to friends in the past and recommended them to others. I have not tried them on animals only humans. They last pretty much forever. Not as good as the Tick Twister. I ordered both at the same time as I'm going to war with these things. 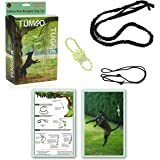 The key is tough to use, because I have golden retrievers and their fur is long and thick so getting down to the tick itself is tricky. If you can get a spot on the tick, the keys work alright, but the twister holds the tick better as well. 5.0 out of 5 starsA summertime must-have! 5.0 out of 5 starsLove these bad boys. I hand these things out to friends like I'm running for mayor and always keep one on my key chain. If you find everything about ticks wildly repulsive (and I do), this is the way to go. Easy to operate no matter how creeped out you are. Just pull the tick with the key, stick the tick directly to a piece of tape, and toss the tape. 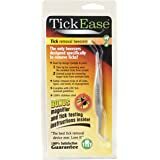 You never have to touch the tick, and no recurring nightmares about whether or not the tick escaped the tissue and got out of the trash can back into your house. If I'm that freaked out by ticks and can use this, you can too. This tool is great, but I just got done tearing up a tiny, extremely flat, disc-shaped tick while trying to remove it from someone. As I pulled, the tick would inevitably get misaligned with the "funnel", one half being above the tool (where it needs to be for this to work) and the other ending up below. 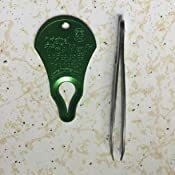 In retrospect: After you place the key over the tick, you may need a tool (preferably tweezers, but whatever) to keep the tick's body lifted up slightly (don't squeeze, just lift) from the skin WHILE you pull the key. Had that occurred to me at the time, I'm sure the funnel system would've worked much better than it did. Tick Key guys: Please consider revising your instructions... This seems obvious now, but in the heat of the moment it simply didn't occur to me. 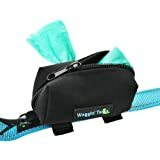 I purchased this for my lab because sometimes when we go on walks, especially the trails that have lakes, somehow these annoying critters decide they want to come home with us. I lost my original tick twister someone gave as a gift so I had to resort back to tweezers. I came across this and thought this would be easy and perfect. I use k9 advantix, but sometimes it slips my mind that it's time to do another application. 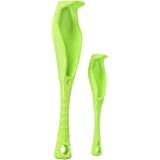 I purchased this around 3-4 months ago and I obviously didn't want my dog to get any ticks, but I couldn't wait to use them. The day finally came, ticks galore. She had around 10 ticks on her so I grabbed this little gadget. I put on reading glasses to magnify my vision and followed the directions. The tick was still there, so I reread the directions to see if I was doing something wrong, nope. I tried again with more pressure and still didn't work. After a third time fail, I tried on another tick on a different part of her body and the suckers would not come out. I felt bad because I wasn't sure if I was hurting her and I wasn't wasting anymore time with this. I just wanted to get the ticks off her so I went back to the tweezers and wrapped them in tape. I really wanted to love this like I loved it when I received it. I don't know if this works better for humans or works for the size of the tick, but failed for me. I also don't think this will work under the neck area above the chest because she had a couple there. The skin is too loose around the area so you have to pinch pretty good. I will try this again the next time a tick is around and if it works, I'll leave an updated more positive review. 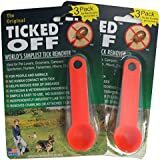 5.0 out of 5 starsGreat tick remover! 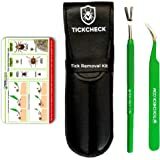 I am so pleased with how this tick remover works! 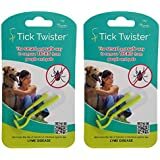 This has been a very active year for ticks (still is), and since my cats can go outside, they pick them up regularly, especially the long-haired white one, who seems to be a tick magnet. The poor guy put up with me pulling ticks off him with my fingers, but sometimes chunks of his fur came with them, and tweezers were worse, because sometimes they would leave the head. I am so happy I decided to try this these Tick Keys. 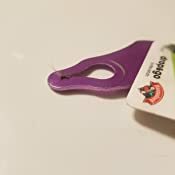 Use them the way it says in the instructions, by slipping it over the tick, then pull straight back, not up, and so far, they have worked every time. The only one happier then me are the cats! Great product! 5.0 out of 5 starsDefinitely recommend!! I learned about the tick key from a vet tech when I took one of our barn cats to be neutered. He had 8 ticks and the tech whipped out her tick key and quickly and efficiently removed all 8 ticks who were in various states of inflation. I came home and ordered the set of three. I kept one at home, one at the barn and gave one to my sis who has 3 cats. We have used all three tick keys and they have worked perfectly each and every time on the first try. You never have to touch the tick and the cats who we have used them on seemed completely unfazed. Definitely recommend! !